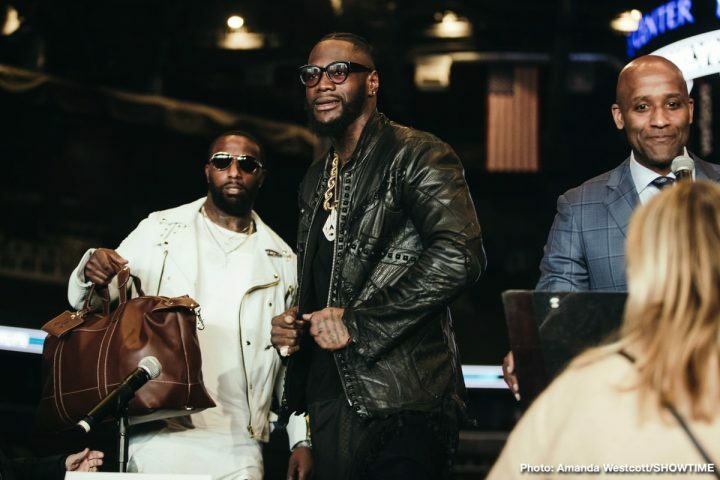 By Scott Gilfoid: Eddie Hearn has put together a top five list of who he considers the elite heavyweight in the division, and he surprisingly has WBC champion Deontay Wilder rated BELOW Anthony Joshua, Tyson Fury and Dillian Whyte. What’s interesting to note is Hearn’s list consists of three heavyweights [Joshua, Whyte and Usyk] that he personally promotes. As such, some fans might feel that Hearn has a bias in picking his own heavyweights and throwing them on his top five list, and leaving out talented fighters like Luis “King Kong” Ortiz, Adam Kownacki, Joe Joyce, and Joseph Parker. British promoter Hearn’s ratings for the top five heavyweights in the division is subjective obviously. Hearn has two of his own heavyweights signed with his Matchroom promotion in the top five in Joshua and Whyte. Having your own guys at the top of the list is expected by Hearn. The question is, does Hearn really believe that Joshua and Whyte are better heavyweights than Deontay or is he just ranking them above him to keep them happy and to help promote them in the eyes of the boxing public? Hearn’s decision to rate Whyte over Wilder on his last has some boxing fans feeling that he’s trying to be extra nice to his Matchroom fighter due to him failing to produce him a world title shot. Hearn has asked the World Boxing Council to make Whyte (25-1, 18 KOs) the mandatory for the May 18th fight between Wilder and the current WBC mandatory Dominic Breazeale. Hearn wants the winner of that fight not to be able to have any intervening fights before needing to defend the WBC title against Whyte, who failed to fight in an eliminator when the sanctioning body wanted him to face Luis “King Kong” Ortiz. “I go Joshua, I go Tyson Fury, I go Dillian Whyte, I go Deontay Wilder, and I go Oleksandr Usyk,” Hearn said to Secondsout. “For me, they are the five best heavyweights in the world. Joshua, Fury, Dillian Whyte, Wilder, Usyk, that’s my gut feeling,” Hearn said. 1. Anthony Joshua: AJ is still considered as the #1 heavyweight in the world by many boxing fans, but he still hasn’t picked up that signature win that he needs for him to be considered the real deal. Joshua’s biggest win of his career came against an old, inactive and shot Wladimir Klitschko, who came close to beating him, and looked like the far more schooled fighter of the two despite the fact that the Ukrainian was 40-years-old, coming off of a two-year layoff and a loss to Tyson Fury. Joshua is a shaky #1, and he probably doesn’t rate that spot given his lack of quality wins. 2. Tyson Fury: Fury was knocked down twice by Wilder last December, and arguably knocked out in the 12th round in a fight that should have been stopped. It looked to some boxing fans that not only should the fight have been stopped in the 12th round, it also appeared that Fury was given a long count by the referee, who spent time getting Wilder go go back to his neutral corner before administering the count to the 6’9″ fighter. 3. Dillian Whyte: The argument that you can make for Whyte not rating this position is he looked terrible in his two fights with journeyman Dereck Chisora, and should have lost the first match between them in 2016, which was scored a controversial 12 round split decision. In the recent Whyte-Chisora II rematch last December, Whyte was losing the fight going into the 11th round when the referee suddenly stopped the action and penalized Chisora for throwing an elbow. Chisora, upset at being penalized for the second time in the fight, unleashed a wild haymaker, and nailed with a left hand counter by Whyte and subsequently knocked out. Earlier in the fight, Chisora was penalized for throwing a low blow. Whyte was never penalized during the fight for his roughhouse tactics. Some boxing fans believe the referee was showing favoritism to the A-side fighter Whyte in taking points away from Chisora in a close fight. Just ignoring the point deductions and the final result, Whyte failing to dominate a journeyman level fighter in Chisora makes it difficult to see him ranked above Deontay Wilder. 4. Deontay Wilder: Being the WBC’s undefeated champion for going on five years makes a good argument that Deontay should at least be considered the #2 heavyweight in the world if not the #1. 5. Oleksandr Usyk: Hearn has Usyk (16-0 12 KOs) ranked as the top five heavyweight without him ever having fought in the division? It doesn’t make sense to rank a fighter in the top five of a weight class that he’s never fought at, does it? In looking at how badly Usyk struggled in his short fight with Joe Joyce at heavyweight in the World Series of Boxing five years ago, one would be hard pressed to put Usyk even in the top eight of the top heavyweights. Joyce was wearing Usyk down in that fight, and had his face badly reddened. Had that been a 12 round fight, it’s hard to imagine Usyk making it to the 10th. He was getting worn down by the bigger, stronger Joyce. That was before Joyce bulked up to 260. When that fight took place, Joyce weighed 230 lbs. If he fought Usyk now, it’s unlikely that the unified cruiserweight champion would have lasted long. Usyk is taking on 38-year-old former world title challenger Carlos Takam (36-5-1, 28 KOs) next month in a 10 round fight in his first fight at heavyweight on May 25 at the MGM National Harbor, in Oxon Hill, Maryland. Takam has lost two out of his last three fights. It’s a safe pick for Hearn to put Usyk in with an old guy pushing 40, who is past his prime, and struggling. It would be wise for Hearn to put Usyk in with Joshua as soon as possible before he loses to someone, because Usyk is not big or strong enough for the heavyweight division in the eyes of a lot of boxing fans. The way that Usyk had problems with Tony Bellew in his last fight in September suggests that he’s not cut out for the heavyweight division. Usyk clearly doesnt belong ranked at #5 at heavyweight. Of course, Usyk is of of Hearn’s fighters in his Matchroom stable, so it goes without saying that he would have him on his list. “So, when you look at it, Dillian Whyte, for me, has done everything he needs to do to get a shot at that title,” Hearn said. “We have a pending situation with the WBC, who are ruling on his mandatory position. He will be back in July, but we want him to be mandatory for the WBC title. I want to make Joshua-Wilder fight, but I also want to deliver Whyte a shot at a world title. This is a situation where it’s being pushed by Team Whyte, and also by me to say he should be mandatory for Deontay Wilder, without any intervening bouts, because of everything that has happened in the past. But we also want to see the undisputed fight [between Joshua and Wilder]. Dillian Whyte is right in there. July [13th] is next. Hopefully, he becomes mandatory for the WBC,” Hearn said about Whyte.